Password protection that rivals the best. Sticky Password may not be as familiar as LastPass or 1Password, but it boasts features that rival both of them, albeit in a much less polished package. It doesn’t quite rise to the top tier of password managers, but it’s more than capable of getting the job done. When you download Sticky Password—there’s no web version of the app—it will prompt you to create a master password. Unlike some other password managers, Sticky Password doesn’t offer a way to recover or reset this password if you forget it, so commit it to memory. You’ll also be asked if you want Sticky Password to sync your data over its cloud network or your own Wi-Fi network. With this unique option, your devices sync only when they’re all connected to your wireless network, so your data never goes out over the internet. It’s a nice added layer of security. After a brief tutorial and installing your preferred browser plugin, you’re free to surf. Sticky Password automatically captures your login credentials when you visit a secure website for the first time and then autofills your credentials when you return. If you have more than one account for a given site, Sticky Password will prompt you to select one from a pop-up window. You can also opt to have it automatically log you in. 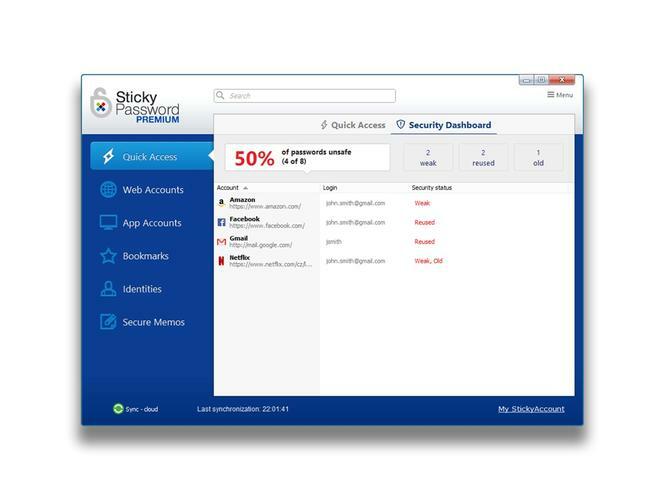 Sticky Password can manage app logins as well as website credentials. Interestingly, Sticky Password will also store application logins. These can be added manually under a separate App Accounts tab in your vault. You can type the app name or browse to it on your hard drive, then enter your user name and password. The password generator, which surfaces whenever you’re creating a new account, defaults to a 15-character password using letters, numerals, and symbols. You can adjust the length, though, from four to 99 characters. Sticky Password immediately gives you a strength rating and percentage. 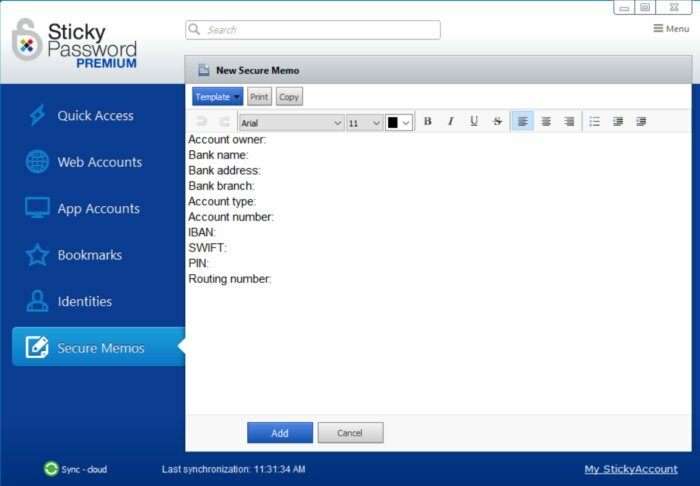 You can audit all your stored passwords by going to the Quick Access tab in your vault and selecting the Security Dashboard. Like Dashlane, it will give you an overall rating for all your passwords, plus strength ratings for each individual one. It also lets you know how many of your passwords are weak, reused, or old, and you can edit any of the entries by clicking the pencil icon adjacent to it. Alas, Sticky Password doesn’t offer a secure way to share passwords. Sticky Password provides templates for all kinds of personal data, though they look a little dated. It offers two-factor authentication using the Google Authenticator app, which sends you a verification code to enter along with your master password. The mobile apps can use biometric ID on supported devices. A Secure Memos tab allows you to add all manner of personal data to your vault. The memo entry fields look much like a note in Evernote: There’s a formatting toolbar across the top, and when you choose a template—credit card, software license, passport, etc.—it populates the text area with relevant fields. 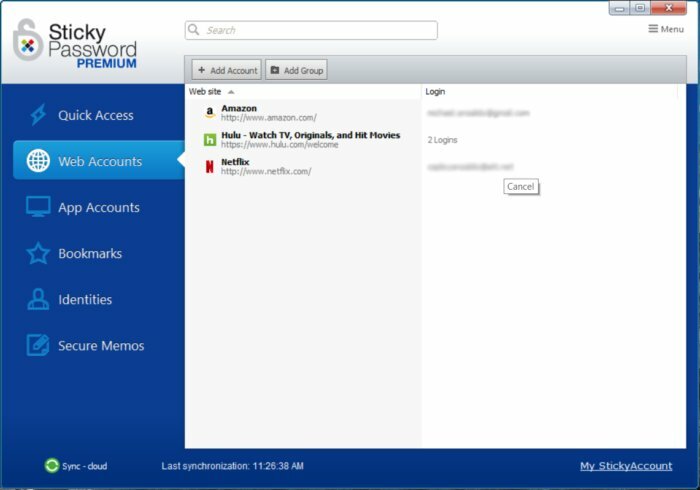 At times Sticky Password’s interface looks downright dated, but don’t let that fool you. It supports some robust password-management features and its Wi-Fi sync is a great feature for anyone desiring an extra layer of protection in light of recent breaches. Its lack of secure password sharing can be a hindrance but that shouldn’t hold you back from giving it a try.